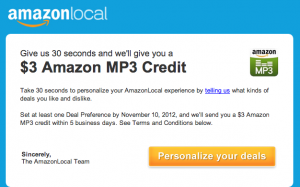 Word on the web is Amazon Local is emailing $3 MP3 music credits when you join and personalize your account (here, just an email required)! No guarantees everyone will get one, but worth a shot to sign up and check your emails! Thank you Wheel n Deal Mama!